Utilizing the best technology to solve your business needs is paramount to getting an edge on the competition, improving efficiency, and maximizing benefit from your IT budget. HP's leadership in blade server technology provides superior user experiences, market intelligent servers built for the cloud era, and dramatic enhancements in productivity and automation that redefines the expectations and economics of the data center. 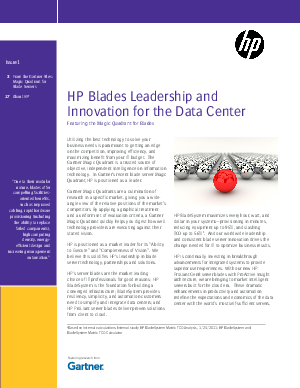 This Gartner Magic Quadrant for blade servers focuses on a market that is becoming ever more complex and diverse and shows how HP continues to innovate and redefine its blade strategy to remain the blade market leader.